There were a couple of small Australian solar power projects that I left out of my look at solar thermal power a little while ago, as I thought they were worthy of separate consideration. I talked about one of these - Wizard Power's technique for storing energy using ammonia - last week. The other project is by a company called Acquasol which is building a plant to desalinate water using solar thermal energy at Point Paterson, near Port Augusta in South Australia. Like Wizard Power and Lloyd Energy's graphite based energy storage technique, Acquasol received an initial round of funding from the (now defunct) Australian Greenhouse Office's Advanced Energy Storage Technology program. In this post I'll look at the Acquasol project and then more generally at water scarcity worldwide and some of the approaches being taken to tackle it. 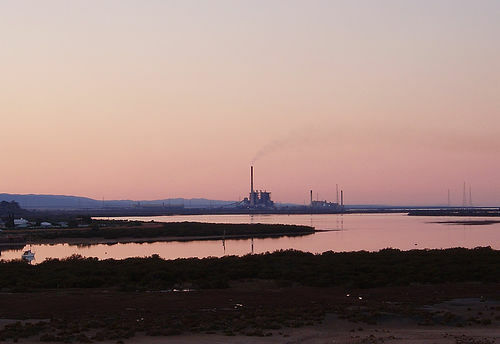 Port Augusta is a particularly suitable location for producing water via desalination, given its increasingly arid climate and remoteness from fresh water sources. 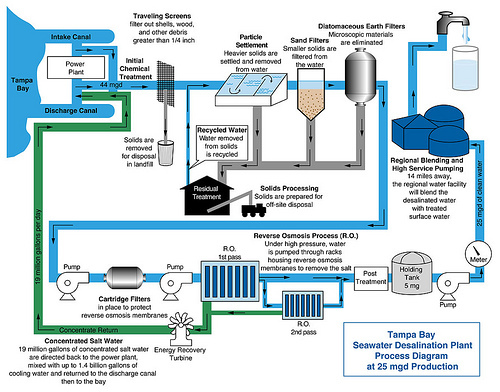 Using solar energy to drive the desalination process is efficient for a number of reasons. Firstly, South Australia is an importer of electricity and suffers occasional supply shortages in summer when the interconnectors to the national grid reach their limits. Secondly, producing water locally saves the energy currently used to pump water several hundred kilometres from the east of South Australia, where the increasingly scarce water is located. South Australia also has excellent solar insolation, and the location chosen is close to existing power lines (for the Northern and Playford brown coal-fired power stations nearby), water pipelines and salt pans for solar brine harvesting. This minimises a lot of the infrastructure costs and also enables a drawback of desalination plants (the environmental impact of discharging briny water back into the sea) into a potential positive, as it can be used to feed a salt production process instead. The Acquasol plant will be producing water using a desalination process known as "multi effects", driven by 1.75-kilometer square concentrating parabolic trough mirror field. The desalination plant, solar thermal storage (apparently using molten salt, but this isn't clear) and other operating equipment will be sited in a small area adjacent to the solar field. Multi-effects evaporates salt water using a vacuum and recondenses the vapor into drinking water. Both require energy, usually between 2.7-4.5 kilowatthours per kilolitre (though improvements to the technology are expected to lower this figure - hopefully to around .7 kilowatthours per kilolitre). At present, pumping Murray River water to the Upper Spencer Gulf consumes up to five kilowatthours per kilolitre. Multi-effects deslination can also use heat as an energy input, skipping the initial conversion into electricity and increasing efficiency. 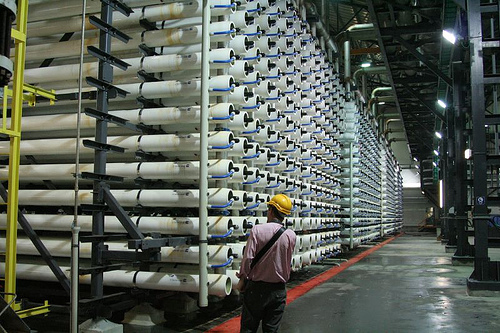 The company expects that by having reverse osmosis desalination and multi-effects desalination operate side-by-side in future, powered by solar energy and incorporating thermal energy storage and a backup gas turbine backup, further operational efficiencies can be reaped that lower costs. The water produced could also be in demand from large water users inland, like BHP's Olympic Dam mine, which currently draws around 30 megalitres of water per day from the Great Artesian Basin, and will need another 120 megalitres per day to service the expansion of the mine. BHP are currently proposing to build another desalination plant at Port Bonython near Whyalla, though this is being resisted for a number of reasons, one being a vulnerable local population of giant cuttlefish. Another Australian experiment with desalination using solar thermal power is being performed by RMIT at Pyramid Hill in Victoria - this seems to be completely independent of the Acquasol project. Australia's troubles with water are well known by now, thanks to our recent bout of intense drought and the impact this has had on agricultural production and subsequently on a number of global commodity prices - rice being the most recent example. The United States has also started to experience issues with water supplies in both the south east and south western states. These issues have combined to make water a sensitive security issue in some regions, with some experts predicting resource wars over water, with obvious parallels to conflict over dwindling fossil fuel supplies (though thankfully water isn't actually depleting - it is more of a quality and availability issue). In recent years a rash of desalination plants have been proposed for Australian capital cities to meet increasing demand for water and to insure against drought induced supply constraints. * Perth led the way, with one plant already completed at Kwinana and another under construction at Binningup. * Brisbane has built one plant at Tugun and is consider more at sites including Marcoola, Kawana and Bribie Island. 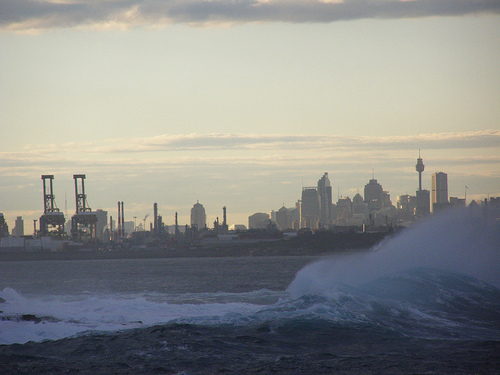 * Sydney has commenced construction of a desalination plant at Kurnell, which has also been the subject of a lot of controversy. Much of the criticism of desalination plants centres around their key drawbacks - they use large amounts of power (ex-NSW Premier Bob Carr used to refer to water from desalination plants as "bottled electricity") and they can have a large impact on the local environment, with danger to wildlife from the inlet valves and from the brine that is pumped back out. The Acquasol venture stacks up quite against other plants well based on these concerns, as it uses locally produced renewable energy, doesn't emit brine and apparently has little local wildlife to contend with. Another criticism of desalination plants is the high cost of building them, with water recycling, fixing leaking pipes in the water system and encouraging local rainwater capture (via rainwater tanks) often being deemed more cost effective and lower impact ways of providing more fresh water. Nevertheless, construction of desalination plants has accelerated elsewhere around the globe as well, with prominent examples in Tampa Bay, Saudi Arabia, Abu Dhabi, Israel and Spain. The multi-effects desalination technique used by Acquasol is just one of a number being put into practice. The other major mechanism is known as reverse osmosis, which is used for around 47% of installed capacity worldwide (vs 36% for multi effects). A promising new technology that is being researched is the use of carbon nanotube based membranes developed by researchers at Lawrence Livermore National Laboratory, which they claim could reduce the cost of desalination by 75 percent compared to reverse osmosis methods. Last year's "AlwaysOn Going Green 100" listed 19 companies concentrating on water, which demonstrates the level of interest in this area in the cleantech industry - though Neal Dikeman has cautioned investors that water is always the problem of the future. Inventor Dean Kamen is another entrant in this area, promoting a relatively inexpensive small scale water purification unit which looks promising. A similar, but much more expensive, device is the solar cube. Another interesting technique for desalination is the OTEC power generation process, which was discussed previously in my post on ocean energy. On a tangential note, there is an obscure alternative energy generation process known as "pressure retarded osmosis", which captures the energy that is released when salt and fresh water mix. While this seems a far-fetched way of generating power (and I'm not trying to encourage any perpetual motion schemes involving desalination plants coupled with osmosis based power generation), there are efforts underway to explore the possibility of generating power in regions where large volumes of fresh water meet the sea. The science behind these projects is based on the phenomenon that when salt and fresh water mix, they are typically warmed by 0.1 degree Celsius. Some Dutch scientists claim the total amount of energy generated at all the world's estuaries is equivalent to 20 percent of world electricity demand. One trial is being undertaken at a fjord south of Oslo by Statkraft, the other at a seaside lake in Holland by the Dutch Centre for Sustainable Water Technology. 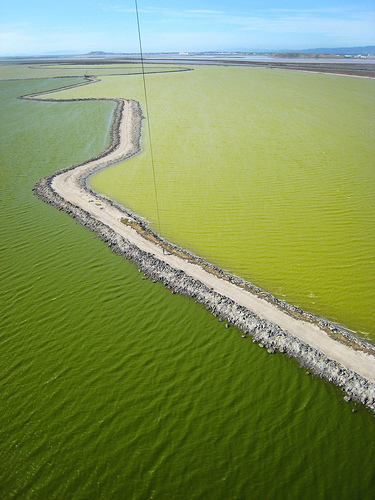 Both schemes depend on membranes placed between the salt and fresh water - however the membranes are both expensive and energy intensive to produce, which means that power generation is not even close to being economical. The membranes are, however, similar to those used in desalination plants that use the reverse osmosis effect - the market for which is growing at around 15% per year. General Electric is one of the major manufacturers and has an "aspirational goal" of producing fresh water from salt through membranes at a cost of 10 cents per cubic metre, with the hope of a new market emerging for power generating membranes a decade from now. Returning to the original subject of Acquasol, one of the (non executive) directors of the company is Stephen Schneider from Stanford University - one of the contributors to the climate science blog Real Climate. I divide my life pretty much in thirds. One third is education, outreach, teaching, media, talking to Congress, parliaments, premiers, etc. and trying to get people—governments especially—to see this problem as it is and not as it's typically portrayed in the media, which tends to focus on the two extreme, lowest probability outcomes: 1. global warming is the end of the world or 2. global warming is good for you. The second third of my time is spent trying to understand the science. When I talk about the science, I don't just mean answering questions like "how many degrees does the earth warm if you double CO2?" That's a very strict bio-geophysical question. I also want to know what happens to the water supply systems of the world if the planet warms by X amount? What would it mean to agricultural productivity, or to sea level, to the intensity of storms and how they impact people? I consider the study of the impacts of climate change just as much a science as predicting how much it will change. The final third of my professional life—which involves value judgments as much as scientific and technological assessments—is spent asking the question: "What do we do about it?" That is, of course, a very difficult question because it involves inventing our way out of the problem on the one hand, but not waiting 20 to 50 years to do that on the other. What is the sequencing of the so-called low-hanging fruit? The first step is performance standards for refrigerators, air conditioners, automobiles, machines and housing efficiency. That gives you a very fast payback. Second step: public-private partnerships where we try to get the private sector to invest in the development and deployment of renewable and other low-carbon-emitting alternatives. They have return on investment criteria that are often too stringent to get a lot of the billions of dollars that need to flow into development, so we will need some federal, or state, and city financial pump priming, along with the bigger private foundations. Third step: you can't keep dumping your tail-pipe waste and your smokestack waste and changing the land surface—all modifying the atmosphere—for free, as if it's an unpriced sewer. Sooner or later there has to be a shadow price on carbon. Whether it's a tax, a cap and trade system—somehow you have to make the polluter pay, and we have to take a look at the efficiency and effectiveness of those techniques. But there's a component in this evaluation that I pay particular attention to that most of the economists do not. That is, if we increase the price of doing business by including a tail-pipe charge for our messing up the climate (and there should be one, because we are messing up the climate), the fact that it might cost me a thousand dollars a year in extra expenses might affect the quality of what restaurants I patronize and which grape I drink. But, what will it do to a poor person? It might affect the quality of protein on their family's table. It's a dilemma. On the one hand you have a moral principle: the polluter pays. On the other hand, the relative fraction of my disposable income that that would represent is much less than that of a poor person in a hot country, or even a poor person in the United States. Energy costs are in that sense a regressive tax. You cannot hold the sustainability agenda of the planet hostage to artificially low prices of commodities like food or energy, any more than you can allow what the first President Bush said at the 1992 Rio Environment Conference: i.e. "the American standard of living is not up for negotiation." In fact, if we're talking about poor people demanding equity, and therefore having per capita equality with us as polluters, we're talking about quintupling CO2 in the next century. That's unacceptable from the sustainability point of view. On the other hand, when we're saying that we will make the world safe for Hummers and SUVs at any and all costs, that's not morally acceptable either. So the question is, how do you make deals where the over-consumers (us) work out a deal with the over-populated and the not yet fully consuming group (developing countries), so that they don't just repeat the Victorian Industrial Revolution with the sweatshops, dirty coal burning, internal combustion engine, etc.? The answer is that these economies in transition need to leapfrog right over it to high technology. Exhibit C: cell-phone. If you go into Central China, they talk to each other on cell-phones—well, so do we (we being the Europeans, Australians, Americans—the OECD type countries). But how did we learn to communicate? We used mega tons of materials: copper wires, and we used energy to do it. China has not done that to our scale. Their cities are wired, but not the countryside. They literally leapfrogged over the Victorian Industrial Revolution to high-tech with regards to communication via cell phone technology. I am not motivated in any of this by knowing the truth. I don't know the truth—nor does anyone else—about the future. What I teach, when I teach my Environmental Literacy course at Stanford, is to help confused students sort out how to tell this guy's claim from that guy's contradictory claim? I say, well, if a new dentist moves into town and hangs up a shingle that says, Painless Dentistry, what are you going to think? What about a new shop claiming to sell only Bargain Antiques? Or what do you think about a country that calls itself the Democratic People's Republic of Such-and-Such? When the claim is in the title it's usually because the opposite is the truth. Check it out before buying it. You have to watch out for the myth-busters and the truth-tellers or the deniers of any risk or the ones who have absolute thresholds below which we're fine and above which everything ends—none of that is a very good description of our more probabilistic knowledge of future events and concerns. What we know is that the warmer we get the more we add systems at risk and the more intense the impacts. We know that we need to slow down the rate at which we increase that risk without having to know precisely where these many impacts thresholds are, because they are not precisely knowable in advance. They are experiments we're performing on Laboratory Earth and—as I said in my book of that title from 1997—it is a "gamble we can't afford to lose".That's how I try to frame the problem. I was told by an environmentalist the other day that using the language of tipping point phenomena (i.e. 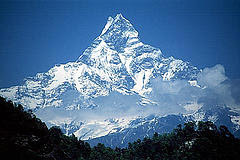 we must move now or we'll be irreversibly lost) is a good way to get people's attention. I said, well, that may be true for some phenomena but we don't know where the points are. We can guess, but what if we're wrong? What if we say that we have ten years and we don't do much? If nothing much has happened in 10 years, what then? Another tipping point 10 years later? People are going to remember what you said 10 years ago and your warnings are going to carry less and less weight and your predictions less credibility. We live long enough that you have to be able to answer for your predictions. I much prefer to say that it just gets increasingly difficult to deal with the more and more warming we keep adding to the system. As with environmental literacy, watch out for the myth-busters, the truth-tellers, the ones with the simple answers from either side. You can almost always believe more somebody who's talking in ranges or subjective probabilities or bell curves, but at the same time isn't shy about saying that there's some real risks out there we need to mitigate. Another reason I have opposed the "ten year framing" is the possibility that society will go on with business as usual and do nothing much. Then what? Do we say in ten years all is lost?? That is very counterproductive—what I call the On the Beach mentality after the Nevil Shute novel that was made into a movie. In it, the radioactive cloud from the nuclear war in the north is moving to Australia and they have months to live. Given that final inevitability, why not go out and race your car and go for derring-do of all kinds and get killed having fun? You're going to be dead anyway soon enough, and radiation sickness is a horrible death. But that's not the right metaphor for climatic thresholds. Every single thing we do that slows warming down is better than doing nothing. But even if you fail to get adequate measures implemented soon, you don't give up, you keep trying to prevent it from getting higher and worse. That's my style, and not easy to sell in a sound bite, but I think you have to tell the truth. To me we don't really know what the absolute thresholds are, so let's not gamble that we might get the most dangerous ones, not because we're sure, but because we're prudent. As for the climate denialists, we've seen their kind before—and gladly they are a vanishing breed in both smoking and global warming, though a few prominent ones are still out there spouting. Just remember, watch out for the myth-busters and the truth tellers and listen to the careful ones talking in ranges and bell curves. Cold seawater circulates through a closed loop of pipes that replace the coolant and compressor found in conventional air-conditioning units. Pipes carrying cold water run beneath fields of crops, sweating freshwater to irrigate plants and chilling their roots, promoting faster crop cycles. Cold seawater passes through Craven's "skytowers," which contain closely packed radiator-like networks of pipes. The frigid pipes sweat in the tropical heat, producing freshwater condensate. Pipes draw warm water from the ocean surface and cold water from the seabed. The warm water enters a vacuum chamber and is evaporated into steam that drives an electricity-producing turbine. The cold water condenses the steam back into water for drinking and irrigation. In general that is true, though South Australia isn't amenable to using OTEC - the surface temperature of the water is too cold. Australia is the dryest continet for about 40 000 years. Find out why and what can be done about it. Mitic CLIMATE ENGINEERING FOR AUSTRALIAN CONTINENT. Huge tidal erosion can revive paleo old dormant mighty rivers, creeks and lakes. CLOUDS AND RAIN ACROSS AUSTRALIAN CONTINENT. what erosion would huge 12m tides do. Ask the scientist how big will evaporation be in bone – dry scorching hot desert if tidal system of canal and channels is made by erosion assisted excavation. Ask the engineer if it can be done.